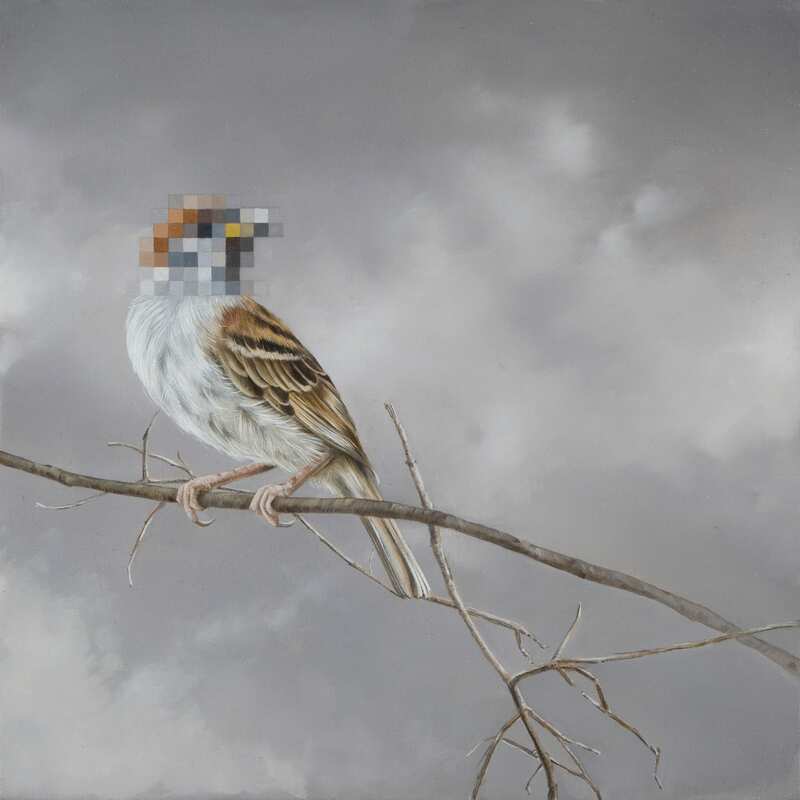 Memoria (2014), oil on canvas, 40×30cm. Respiro (2014), oil on canvas, 50×40cm. 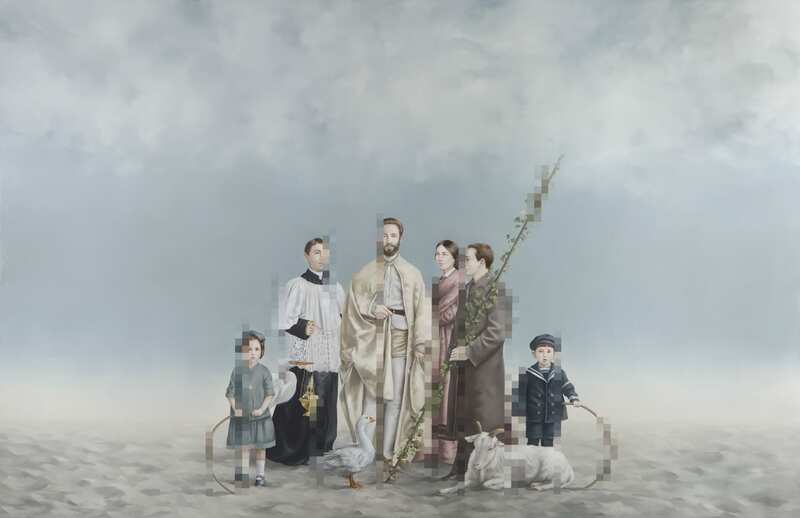 First Act (2017), 110×170 cm, oil on linen. Second Act (2017), 80×70 cm, oil on linen. The between (2017), 60×55 cm, oil on linen. Sky Theory I (2017), 120×120 cm, oil on linen. Aldo Sergio is a Milan based illustrator and painter. 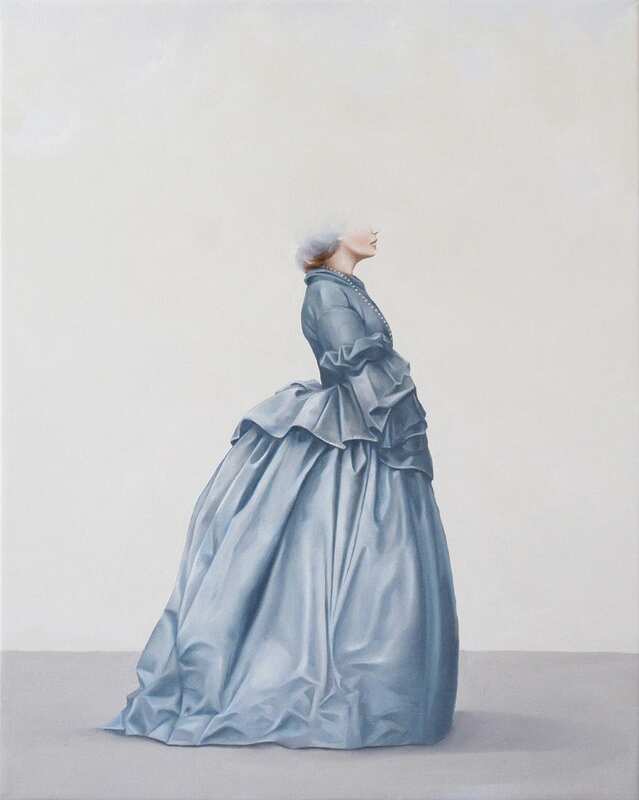 His works at first appear reminiscent of a classical approach to portrait painting and still life. A lady in a simple Victorian dress hitches it slightly to avoid the sand at the seaside. Three earnest looking, white collared men, grouped together, stare thoughtfully. Still life chickens are expertly rendered by his paintbrush, or then there’s the way he perfectly captures the stiff portrait poses of a husband and wife. 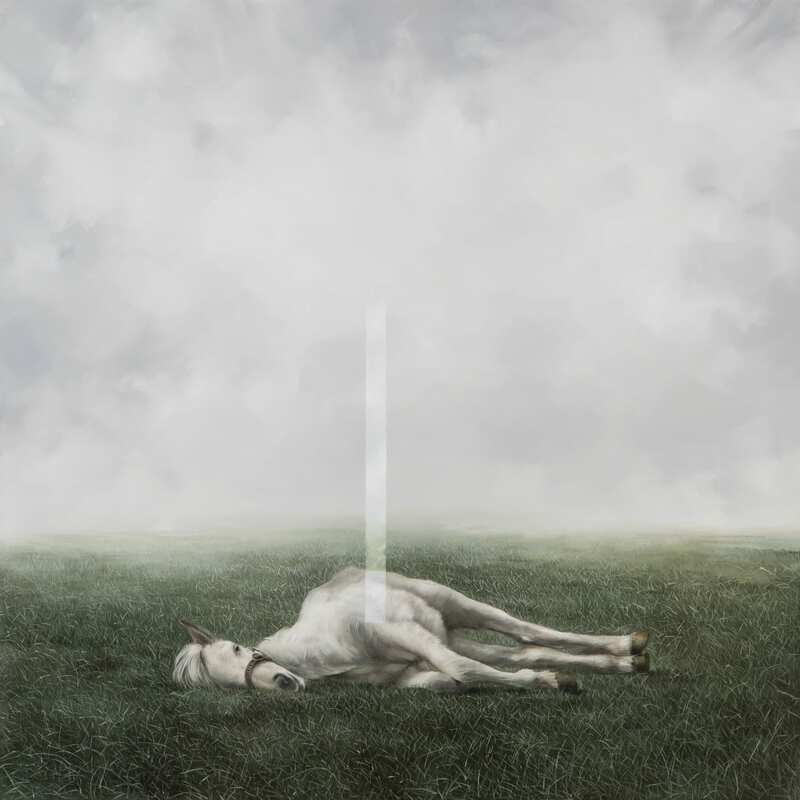 But on closer inspection, his images are not a simplistic interpretation of real life at all. In fact, he has less in common with the Realism Movement than say Andy Warhol’s pop art, and frankly, that’s precisely what makes his work so special. Take the way he pixilates sections of his work. 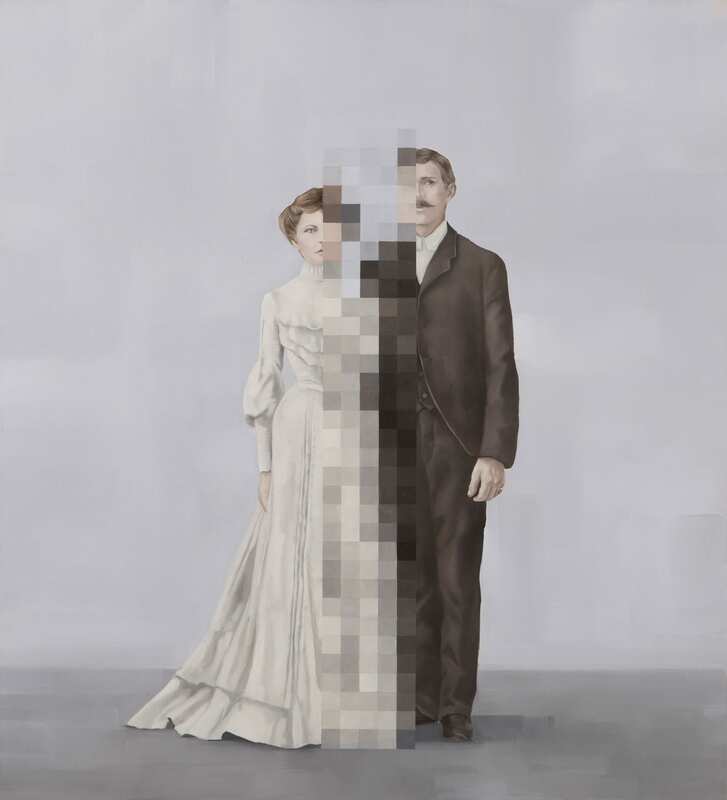 Smack bang in the middle of the three earnest men in their matching grey suits and high starched white collars sits a bunch of pixilated bananas. 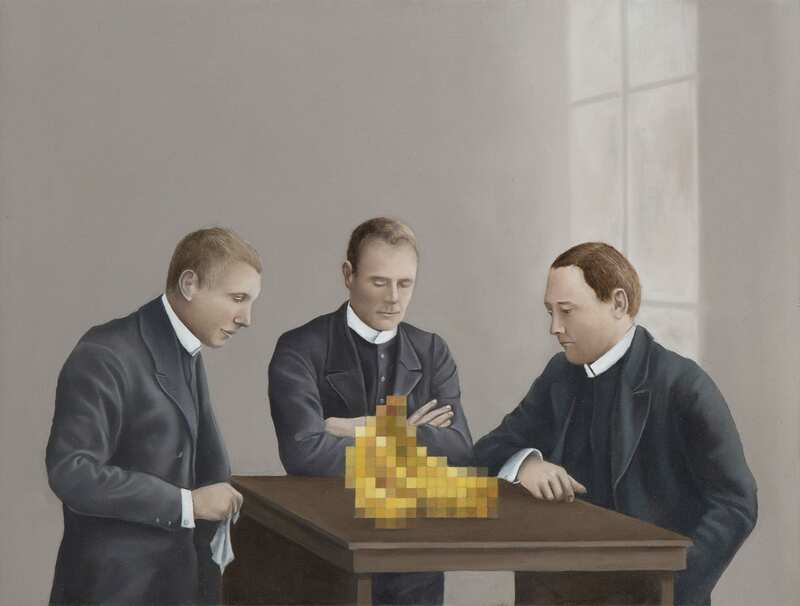 Is it the absurdity of their earnest expressions gazing down at the bananas the irony in this painting or is it the pixelation of the bananas, disguising them as bananas at all? How much do we hide from ourselves on a daily basis? How much excessive attention do we give to irrelevant issues in our lives? Sky Theory II (2017), 120×120 cm, oil on linen. 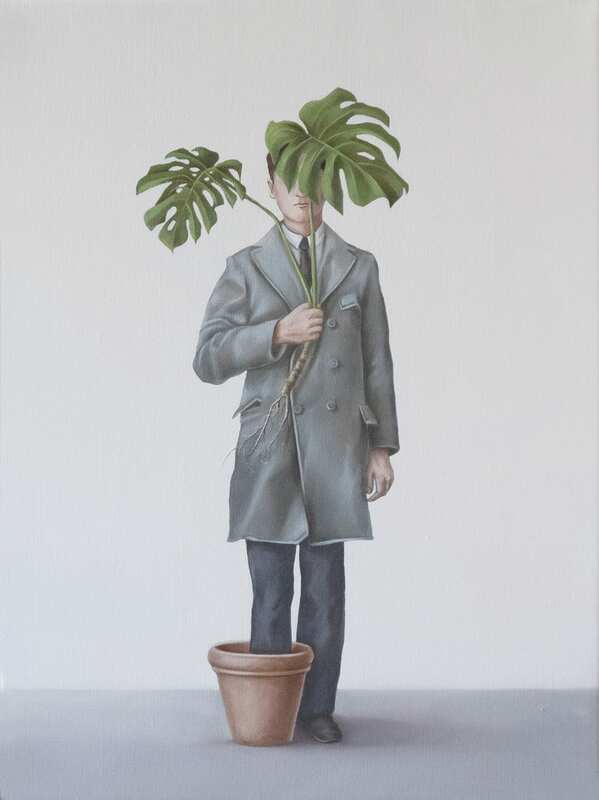 White Collar (2013), 30×40 cm, oil on linen. The Altar (2017), 65×65 cm, oil on linen. 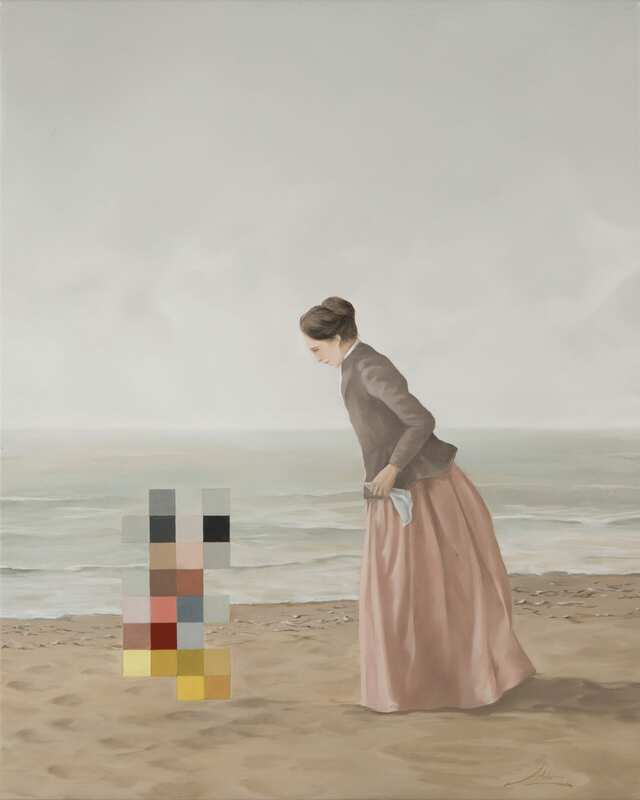 On the Shore (2013), 50×40 cm, oil on linen. Suzume (2015), 28×28 cm, oil on linen. 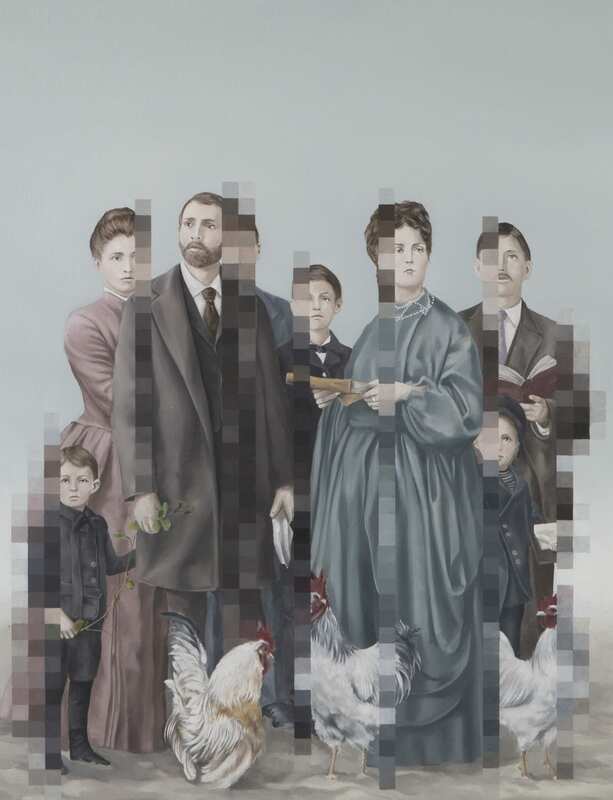 Sergio’s family portraits have sections of each individual pixilated. It begs the question, how much is real in each of us? How much is fragmented and only partially seen by others? How much of us is partly or completely, misunderstood? The artist does not shy away from the more controversial subject matter either, religious references are explored in his work too. The Madonna in her soft, blue pastel robe stands in a field of grass. The blades of grass are crystal clear, each stem precise and hyper-real. But the religious symbol is obscured, pixilated. Is it indeed the Madonna? Or do we think that’s who it is? Why is she not as real as the grass? Is our capacity to see the real Madonna hidden from us because we are so focused only on what we can physically see or touch? 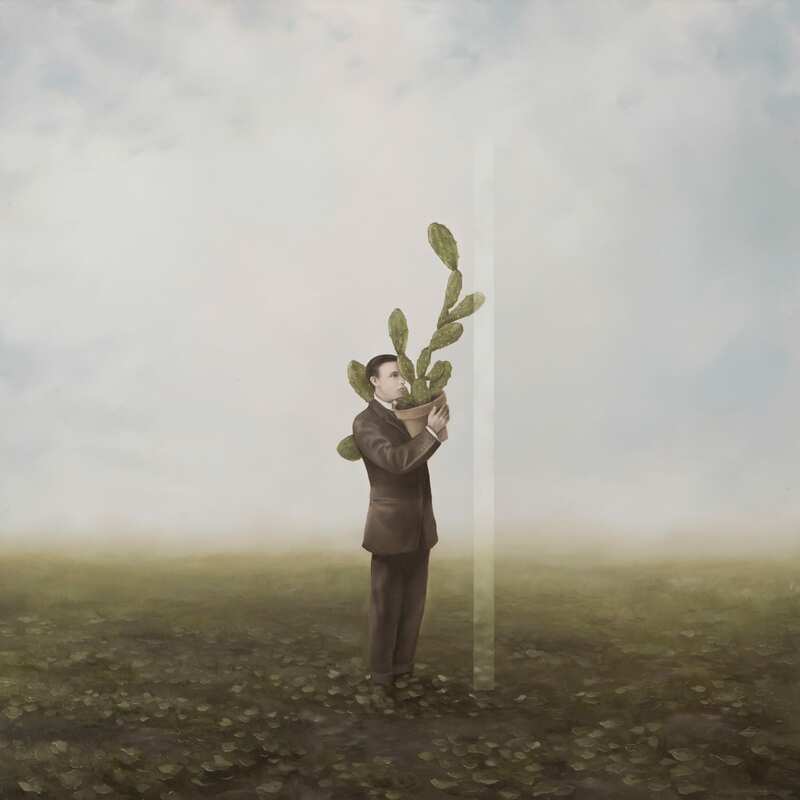 His work twists meanings and highlights biases. It also makes us question our own perspective. Sergio’s work offers the element of surprise, of unexpected moments, of challenging the way we see reality through the lens of our everyday vision. 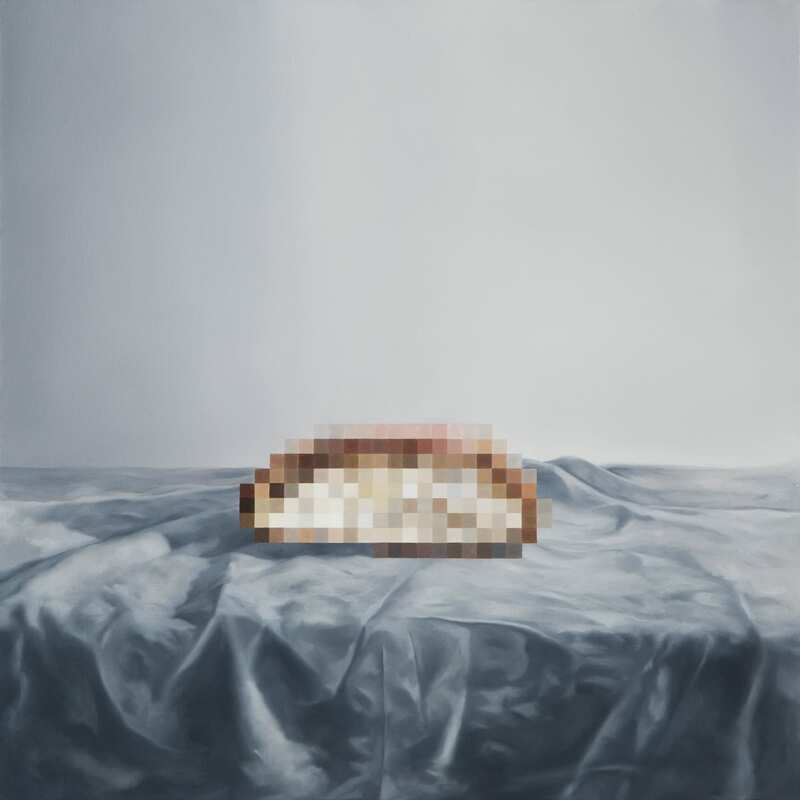 Through the use of his pixels applied to religious icons, still life, fast food, beaches, fields and portraits, the artist highlights the absurd, the mystical, the unexplainable, the ridiculous and the profound. Gir Design Showroom in New Belgrade, Serbia by Studio AUTORI. The Stella Collective’s Take on British Dining With ‘Botanical Punk’.